Whilst, generally speaking, I like the fact that this had been renamed to BizTalk Services (even if it means that searching information online about it will be somewhat difficult, due to the raft of publications on BizTalk out there), I suspect that this will only add to the confusion. In any case – my answer has been, and will be for the foreseeable future – BizTalk Services, for the most part, is a great complimentary component to BizTalk. Sure – in some cases it can be a component in a solution that does not involve BizTalk, but it is very far from doing everything that BizTalk does, and – as far as I know – there are no plans to make it so. So – if the two are so complimentary – how does one integrate BizTalk and BizTalk services? 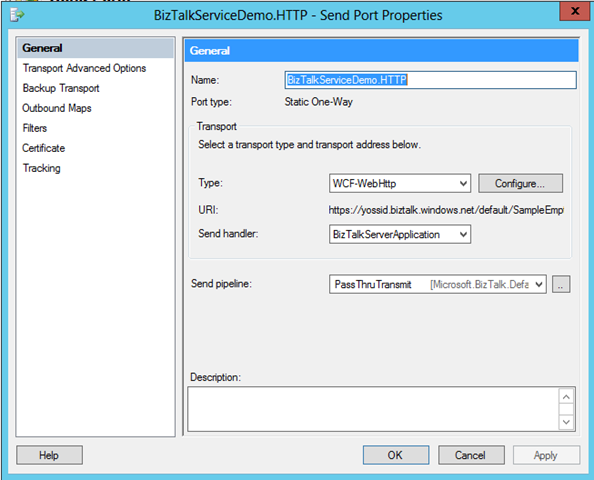 Going in one direction – BizTalk Services to BizTalk Server – is very easy – one can publish a web service on BizTalk and consume that from BizTalk Services, maybe leveraging the Relay Service, part of the Windows Azure Service Bus to traverse the firewall. 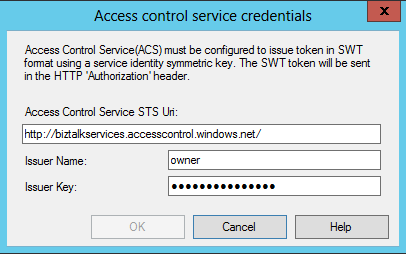 In some case one might want to publish the message from BizTalk Services to a Queue or a Topic on the Windows Azure Service Bus and read that from BizTalk using the built in capability. There are plenty of options to choose from. Going in the other direction, though, is less flexible. At the time of writing BizTalk Services only support 3 way to deliver messages to it – HTTP, FTP (ok – including FTP/S, so maybe 4) and SFTP. To my surprise there is no built in capability to reading messages from the Windows Azure Service Bus or the ability to publish a web service. Next, I wanted to make sure BizTalk is working (and I still remember how to configure it!) so I created a simple, messaging only, scenario – I started with a simple File Receive Location to File Send Port. 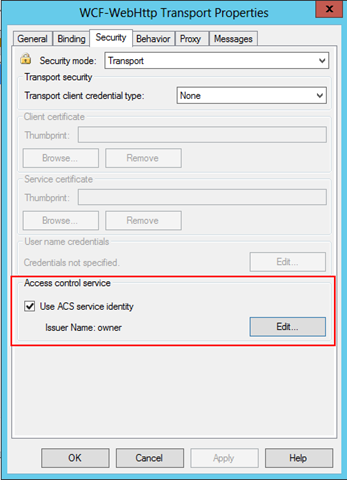 To do this I needed a solution that will allow me to obtain the ACS’ token for this request and inject it as an HTTP header to the outgoing request. 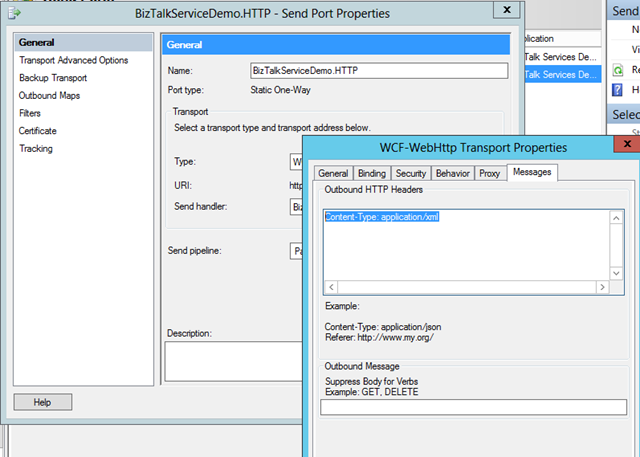 At this point I was sure I’m going to need to implement a custom WCF behaviour that will get the ACS’ token for the request and manipulate the outgoing message’s http headers to include the token but then it hit me – BizTalk already knows how to do that, because it has built in support for Windows Azure Service bus integration, which uses exactly the same mechanism. Awesome – a big chunk of work I expected to have to do – create and configure a custom behaviour to call ACS and obtain a token and add it to every outgoing message – was all done for me! At this point I had to try again, and it looked promising, alas I did get another error – this time about not being able to establish trust relationship for the SSL/TSL secure channel. This makes sense, it is exactly the issue I had with deployment of my BizTalk Service project initially and of course it is because I’m using a self-signed certificate so I promptly added the certificate to the Trusted Root Certificate Authorities store on my BizTalk server and tried again.